Capt. 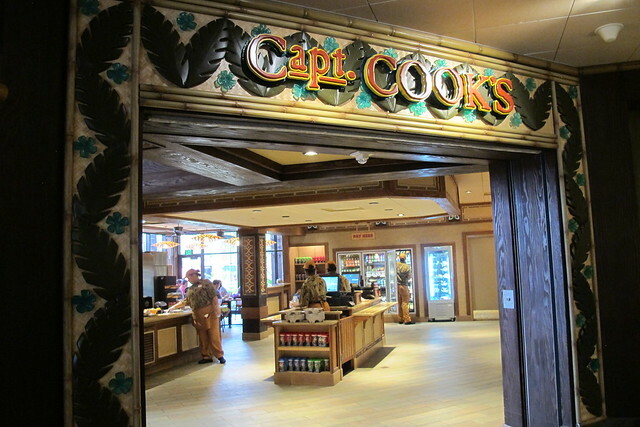 Cook’s reopened in August 2014 and we got to see its new look last month when we stopped by for a meal before drinks at the Tambu Lounge upstairs. (Alas, the bar opens at 1 p.m. but doesn’t serve food until 5 p.m.) Rustic, natural-looking materials (like wood in various tones) play off warm oranges and bright, colorful images. 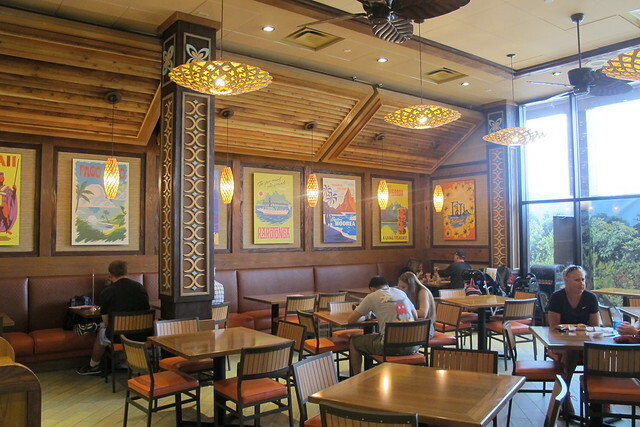 The light fixtures, flooring, tables and chairs were all changed for the better, too. 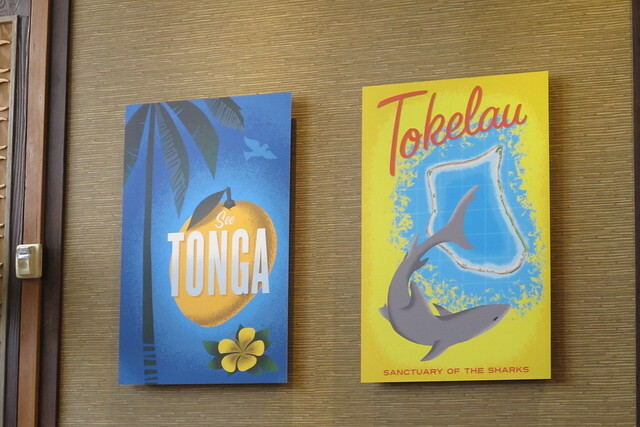 I especially love the 12 vintage-style travel posters highlighting the Polynesian islands after which the resort’s longhouses have been named: Hawaii, Fiji, Tonga, Samoa, etc. 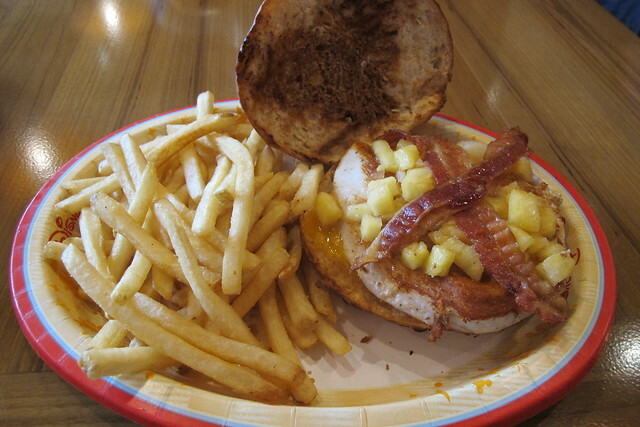 On the lunch and dinner menu (served 11 a.m.-11 p.m.) you’ll still find mainstays like the grilled chicken sandwich on a pineapple coconut bun ($9.49, pictured), pulled pork sandwich, bacon cheeseburger and flatbreads. 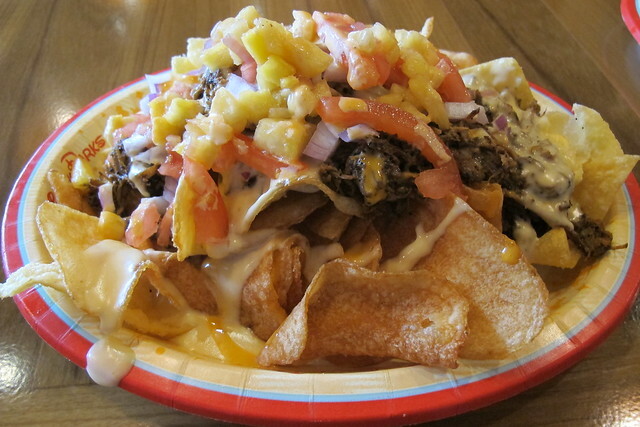 (With the sandwiches you get a choice of fries, chips, steamed vegetables or Asian slaw.) 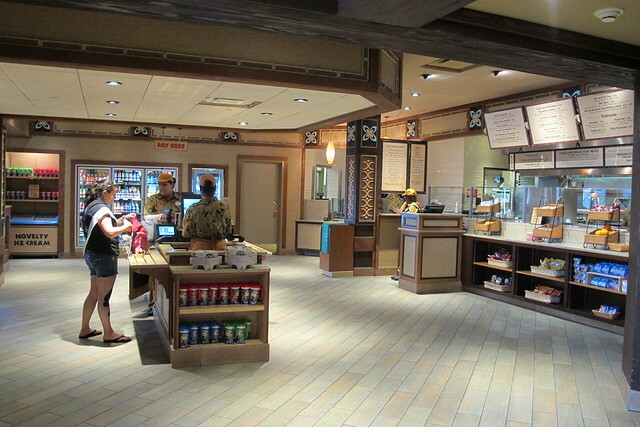 A slew of new dishes were also added recently, including fish tacos, a noodle bowl, coconut curry meatballs, a hot dog with garlic ketchup and mango relish, and buffalo fried chicken and waffles. In the mornings from 6:30 a.m.- 11 a.m. you can drop in for Tonga Toast, The Poly’s notorious “banana-stuffed sourdough bread, battered and deep-fried, and dusted with cinnamon sugar.” It’s a staple from the breakfast menu at Kona Café upstairs, but I appreciate that it’s also served here so one doesn’t have to worry about making reservations in advance to try it. 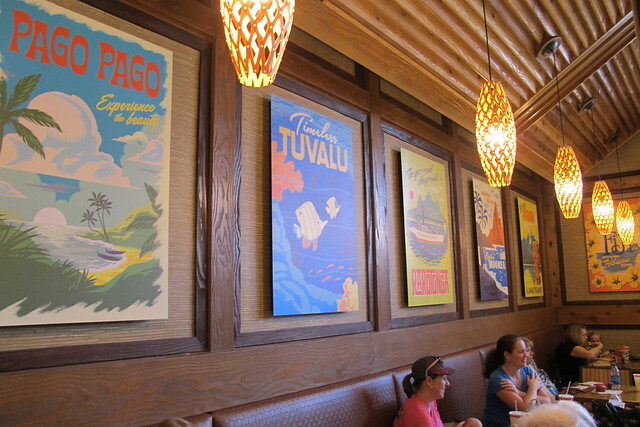 With the imminent opening of its neighbor, Trader Sam’s Grog Grotto, I imagine Capt. Cook’s will get a boost in business from the overflow of people who won’t be able to get in next door. 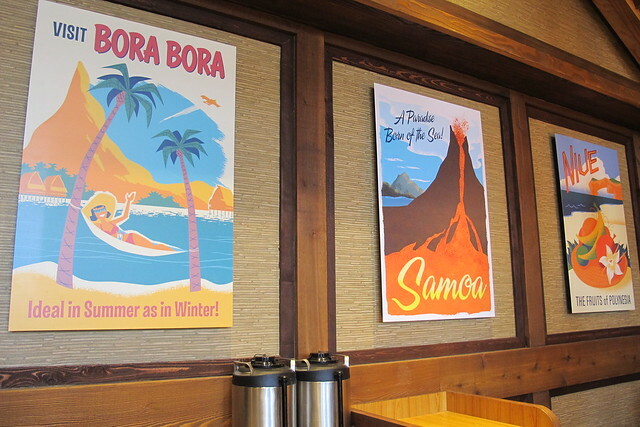 Naturally, the new tiki bar would be at the top of my list if I were there, but Capt. 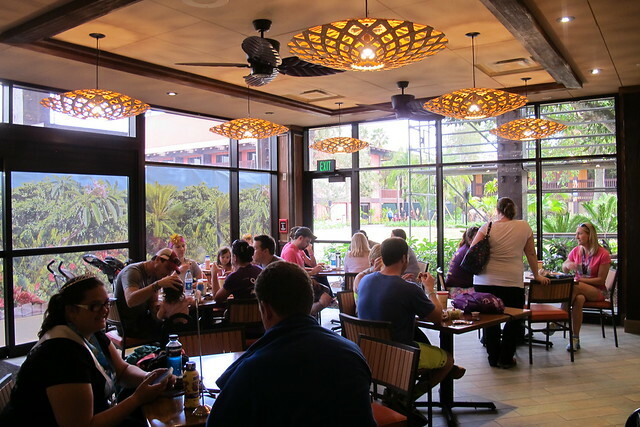 Cook’s should get credit for being a pretty delightful option for a quick, casual meal at Disney’s Polynesian Village Resort. Love the posts about the resort. On my bucket list!